For the third and final in my recent mini series of Iceland photo book reviews, I’m looking at one that seems to have achieved some kind of contemporary classic status: “Iceland”, by Josef Hoflehner. One thing really needs to be adressed up front. Anybody who decides to specialise in square format, monochrome, long exposure landscape shots is going to get compared with Michael Kenna, and that’s a scary prospect. So let’s leave that aside, for now. I’d been dithering about buying this book for ages. Looking at Josef Hoflehner’s website though, I was never that blown away by the photos. But it seemed that my collection really would be incomplete without it, so finally I ordered it direct from the author. One thing I really have to comment on is that the packaging was amazing. So much bubble wrap that it would probably have survived a drop from several hundred feet. But unfortunately this caught the beady eyes of the Swiss Customs, who charged me the 2.6% import duty they normally waive - and a handling charge over half the cost of the book. Oh well. Anyway, after half an hour or so of unwrapping, I got the book open, and was immediately blown away by the print quality. It really is gorgeous, and makes the photos spring to life. So good you feel like you should wear cotton gloves to read it. So, excellent first impressions. Josef Hoflehner’s style is clearly minimalist. There are a number of photos of poles sticking out of the sea, with or without bird perching on top. Seascapes tend to dominate, these being something of a primary material for long exposures. The locations will, by and large, be pretty familiar to anybody who has spent a few days or so in Iceland. And this is where things start to go a bit wrong, for me. It’s that I necessarily need to see new locations, but if I’m going to see the same locations that the world+dog snaps, then I’d like to see a personal interpretation, something that’s going to catch my attention. And, sorry, but using the Michael Kenna preset, in a fairly heavy handed way, doesn’t qualify. I’m aware that this sounds very harsh. I’m also aware that Hoflehner is highly regarded by people who know what they’re talking about - after all, he was the IPA’s Nature Photographer of the Year 2007. But I find this collection strangely unengaging. It’s pretty telling that I’ve got 3 or 4 photos which are almost identical to his, apart from the 4:3 frame and the colour. And I know just how obvious they were. The “rocks in the sea”, and the telegraph poles in the sea (within urban Reykjavik, by the way), just don’t do much for me, in particular in the context of a book which is supposed to be about Iceland. Of course, it is entirely possible to put a very different twist on “about Iceland”. It doesn’t have to be pretty landscapes. It doesn’t have to be landscapes at all. In fact a book of photos of overweight people with badly fitting clothes stuffing hot dogs could easily be “about Iceland”. But for that to work, you’ve got to be consistent. And long exposures of rocks in the sea which could be anywhere in the world, and if anything resonate with a more Far Eastern visual ethos, don’t fit in comfortably. It’s ironic that in the narrative that serves as an introduction, he describes a very different vision, albeit in the somewhat clichéd let’s-get-romantically-stuck-in-a-snowstorm pseudo-explorer style which seems to appeal to the Germanic contingent. But I searched in vain for any real photographic counterpoint to that tale. There are some good photographs in this collection - there are even a couple of great ones (one of which is on the cover). But there’s also a lot of repetition, some dodgy compositions, and a fair of amount of humdrum which cranking up the contrast to 11 doesn’t rescue. 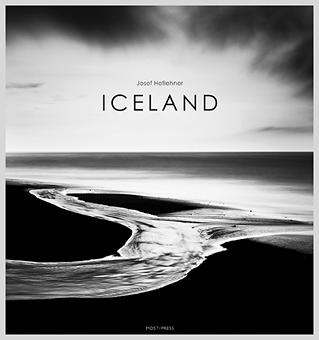 Josef Hoflehner is clearly a very good photographer, but I don’t think that “Iceland” is his best work. Well, that’s my opinion. For what it’s worth. You can make up your own mind by buying “Iceland” direct from the photographer, or from Beyond Words. Previous entry: Near or far ?